San Diego Football Network: Prep Football: El Cap captures Grossmont Hills crown, Warhawks soar above Western League, six teams stay perfect, and more! Prep Football: El Cap captures Grossmont Hills crown, Warhawks soar above Western League, six teams stay perfect, and more! Are the Vaqueros an Open Division team in Division II team's clothing? The El Capitan Vaqueros (10-0, 5-0) capped off their perfect regular season with a 24-17 come-from-behind win over the Helix Highlanders (8-2, 4-1) Friday night to clinch the outright championship of the Grossmont Hills League. 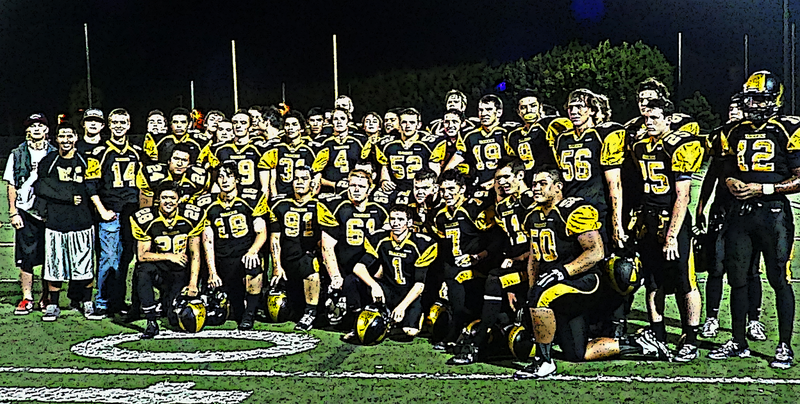 The big win ended the Highlanders' five-year reign of East County dominance at 31 wins. While the Highlanders are set to compete in the Open Division Playoffs as the No. 3 seed, the Vaqueros will have to "settle" for the No. 1 seed in the Division II bracket. With six of their 10 wins coming against Division I opponents (including three that are in the top 11 of the Power Rankings that decides the playoff seedings), El Capitan looks to be more deserving of a berth in the Open Division. Had El Capitan qualified for Division I prior to the season, their 46.90 point average would have been enough to finish third in the rankings, landing them the No. 3 seed in the San Diego Section's top bracket, with Helix dropping to No. 4. The D-II tourney won't be a cakewalk by any means. The bracket will feature San Marcos (9-1), Palomar League champion Rancho Bernardo (8-2), Imperial Valley champion Brawley (9-1), Grossmont Valley champion West Hills (8-2), among other talented teams. The official playoff pairings for all six divisions is scheduled to be released today during a selection meeting taking place at the San Diego Hall of Champions. The Madison Warhawks (7-3, 4-0) clinched their eight straight Western League title after defeating the Point Loma Pointers (8-2, 3-1) 36-14 Friday night. The win extended the Warhawks' win streak to seven games after starting the season 0-3. The Power Rankings have them receiving a No. 3 seed in the Division I Playoffs. For Point Loma, this ends their seven-game win streak and knocks them out of the Open Division playoff hunt. They'll have a No. 5 seed in the D-I bracket. #8 Christian Patriots (10-0) - It was a shock to learn that Junior RB Adrian Petty didn't make the cut for the KUSI Silver Pigskin Award. The shifty speedster scores almost every time he touches the ball, and is usually benched during the second half to prevent the score from being ran up. Bishop's Knights (10-0) - After a 49-6 win over La Jolla Country Day, the Knights clinched supremacy over the city of La Jolla to go along with their Coastal League crown. Borrego Springs Rams (10-0) - Quarterback Gunner Van Sickle accounted for six total touchdowns, leading his Rams to a 46-21 win over Ocean View Christian, and the San Diego Section's eight-man football title. #4 El Capitan Vaqueros (10-0) - It's a shame that one of the best teams in a the county is unable to compete for the top prize. #1 Oceanside Pirates (10-0) - Next up for John Carroll's squad is another shot at the Open Division title. Sweetwater Red Devils (10-0) - After a league-clinching win over Mater Dei, the county's longest active winning streak has been extended to 18-games.